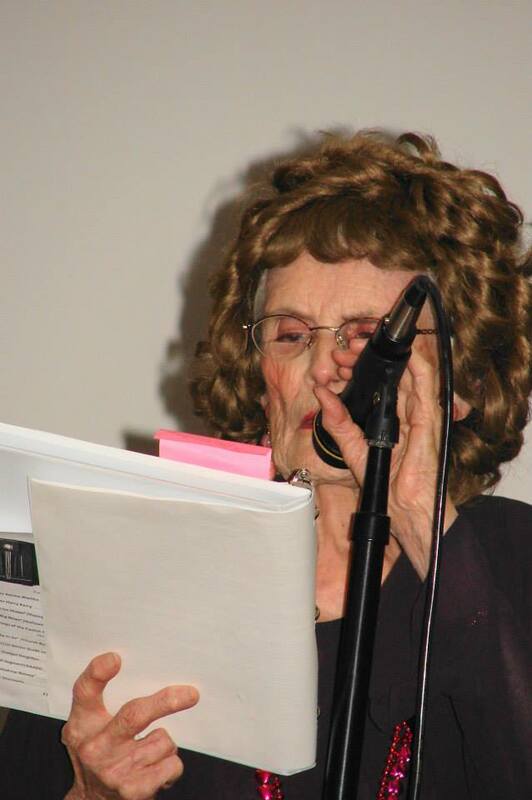 “I’m 89 and I’m still da-ting,” Mom says in a production of “Memories Radio” put on by the Curtain Raisers, a group of senior citizens who are obviously enjoying themselves at Greencroft Retirement Community. Her sing-songy lilt and coy smile is just perfect and the line brings a nice laugh and applause. When I visited Mom in late September, she was working on assembling her costume for the production. The women had decided to dress up as if they were members of the Red Hat Society, and mom had borrowed a beautiful dark purple gauzy dress, hat, wig, and was still hunting for clamp style dangly earrings. So she cavorted a bit for me in her wig, showing how they were supposed to sashay like models as they entered the stage. Neither of us have ever had pierced ears but she wanted earrings to complete her look as a pitch woman for a “Mortuary” in one of the segments. Getting all gussied up is half the fun of Halloween or any campy production, right? 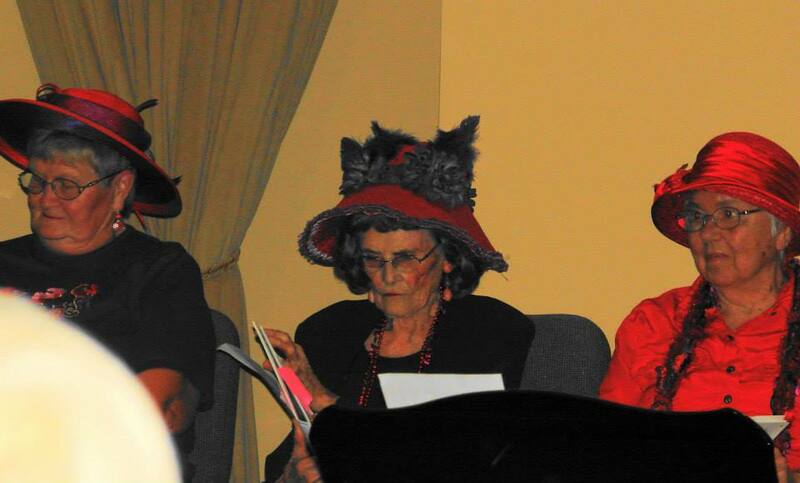 Mom has always enjoyed performing in skits and even being asked to read the scripture for church. She’ll practice and make sure she enunciates slowly, clearly and loudly—one of her biggest frustrations is when speakers don’t get close to microphones and she and many others with hearing loss are left guessing at what’s going on. She uses hearing aids and assisted hearing devices at church but they don’t help if people don’t talk into the mic. Years ago she and other women of her church fellowship (not the church she goes to now) put on some kind of skit for a talent show or fun evening. 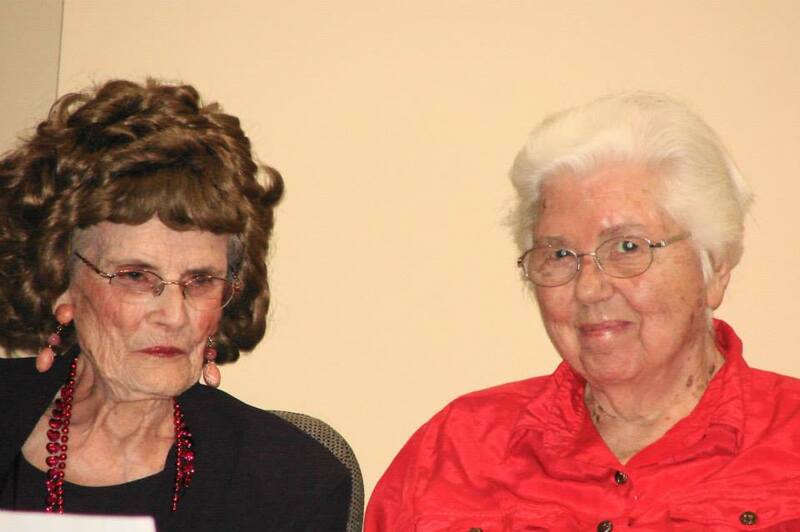 Mom recalls being handed a gospel tract later from one of the older women that implied the group had gone overboard–that the skit was maybe “too silly” for a church women’s get together. Silly, yes! That is the point. 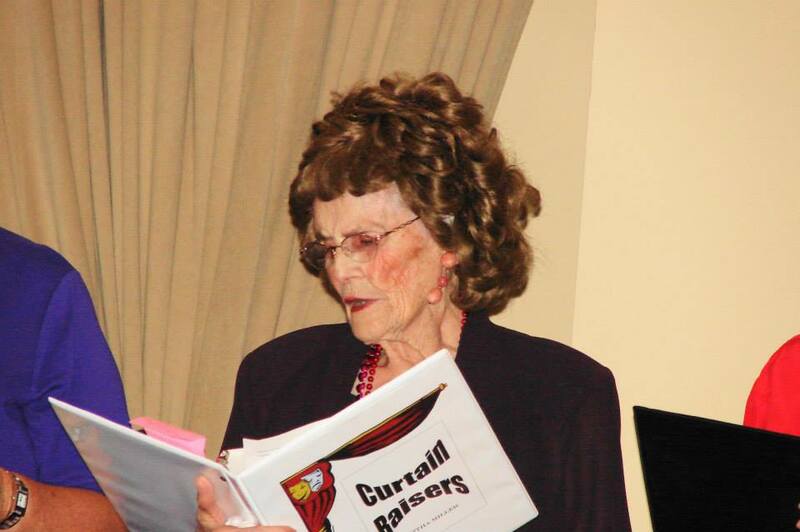 This production by the Curtain Raisers consisted of a series of readings related to the woes of getting older: older people essentially making good fun of themselves. The performers worked hard, getting lines right (this was “radio,” right, so thankfully they didn’t have to memorize their scripts,) and adding flourishes and meaningful looks to add to the effect. 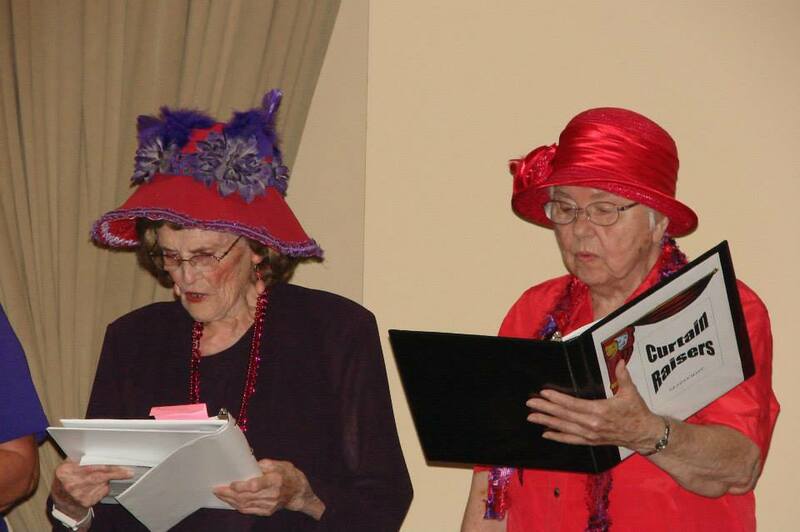 The women, dubbed “The Swinging Senile Sisters” sang a new version of “My Favorite Things,” recalling favorites like false teeth and hearing aids. No, senility is not funny, and I’m guessing that most if not all of the performers have experienced loved ones with this issue. Sometimes the only thing that helps you survive is being able to laugh. 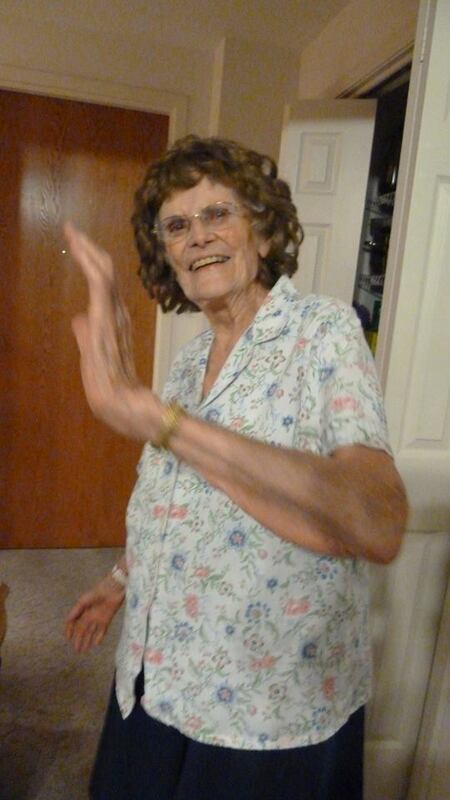 Mom had to read an obituary for the “Pillsbury Dough Boy” who died of a yeast infection and complications of being punched too often in the belly.” She added things like pushing up her partial as she delivered lines like “He was a man who never knew how much he was kneaded and was kind of flakey. The week of production was pretty exhausting, with dress rehearsals for the hour show and then two performances, one at 3 p.m. on a Tuesday afternoon, the second at 6 p.m. on Thursday evening, the better to accommodate friends, family, and fellow senior citizens. As one of the oldest members of the cast, Mom rested up on Wednesday and didn’t try to do much or go anywhere, saving energy for Thursday. The show was such a success they were asked to do an encore performance in November for social work and nursing students at nearby Goshen College studying gerontology and aging. The students did a talkback with the actors after the performance and Mother was pleased to hear questions and comments reflecting how the college students were impressed that “you could be older and still actively do fun stuff” –perhaps a revelation for those kids. And Mom wanted to clarify something for the students. 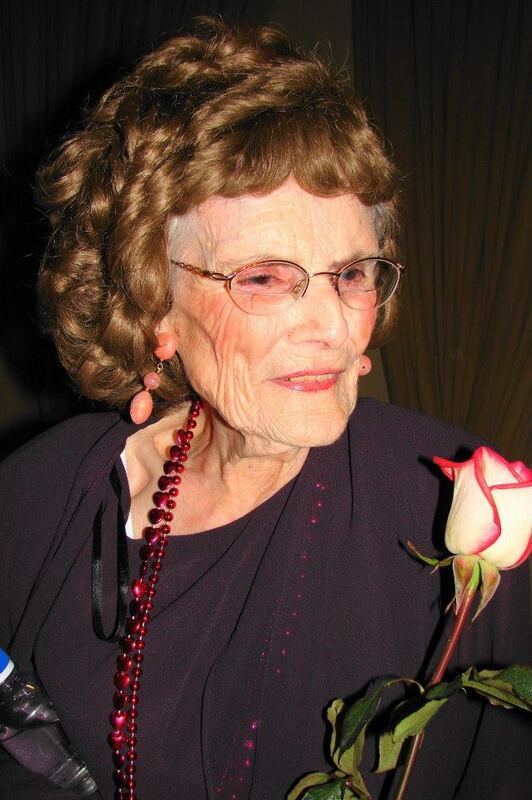 At one point in the conversation Mom spoke up and said, “I am 89 but I’m not dating,” which earned her another laugh. And that’s what its all about, right? Laughter, living, enjoying oneself, being stretched, maybe even doing something at 89 you’ve never really done—working with a director and even having the show videotaped (which is how I got to see the show). After the show, the actors were mostly drained and just glad it was over, but after recouping their energies, they are looking forward to working on a new show in the new year. Someone even suggested they call themselves the Comedy Club, and invited them for another encore. Life is more fun when you have things to look forward to. Maybe someday soon you’ll see them on YouTube. 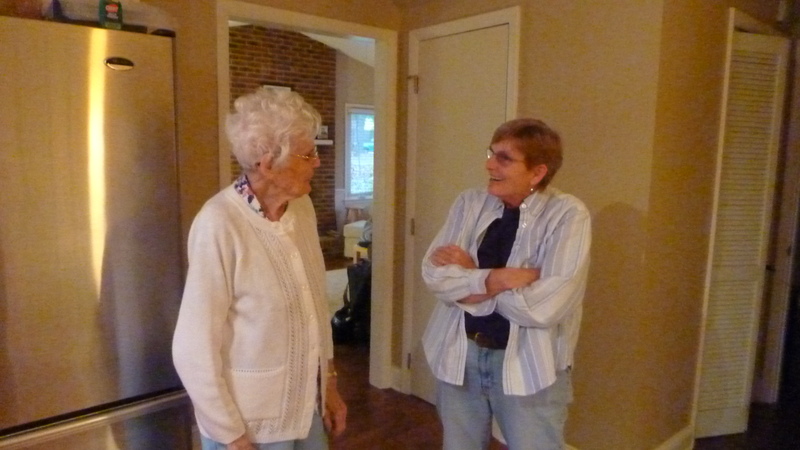 This is mom with her normal beautiful white head of hair, talking with my sister, Pert. With a big thank you to my sister Nancy and her son Larry who were able to attend the production and take these lovely photos. Greencroft Communities are continuing care communities, with Mennonite roots and connections but open to all who share similar values. Thia was a great one to read . I have a few friends who would fit into the same category as your mom and one dear friend especially who is nealry 89 and who is still going strong with her music and other activities .. I am gong to share this with her. Thanks again for your blog. Great fun for all involved, I would say. My mother also stays active in various church and social groups, like Homemakers, and volunteering. What a blessing to have the strength, health and mental capacity to keep going! Thanks for the comment. I should say, 89 is truly a blessing. Eighty nine years of age in this world is a gift. She’s so nice, and I felt just by looking at her picture that she really enjoys her life. Being active and to have a strength like that in her age is truly amazing. The photos are wonderful. Thanks for sharing!! And thanks for commenting! Mom loves it all–the attention, having something interesting to do, all of it.